After a tense day of confirmation hearings on Supreme Court nominee Judge Brett Kavanaugh, Meredith Trainor was having trouble sleeping. “I was so upset about the way the Kavanaugh hearing went. I was really upset about the way the Senators on the judiciary committee treated Christine Blasey Ford and it felt really important to do something here in Juneau,” Trainor said. Psychology professor Christine Blasey Ford has accused Kavanaugh of sexually assaulting her when the two were teenagers. 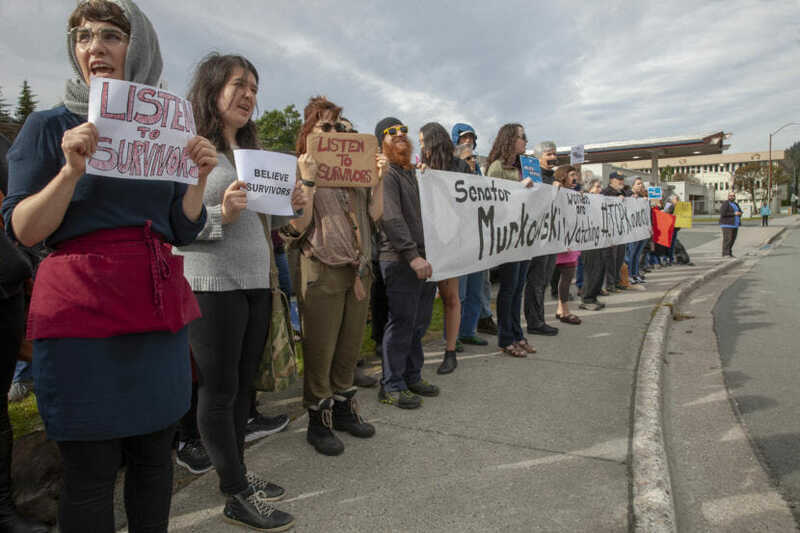 Afterwards, Trainor, a Juneau resident, logged onto Facebook and created an event asking the community to meet her outside of U.S. Sen. Lisa Murkowski’s office on Friday. She wanted to rally in support of Blasey Ford and oppose fast-tracking Kavanaugh’s nomination to the U.S. Supreme Court. Then, she said, she went to bed. By noon on Friday, people were streaming into the narrow parking lot of Murkowski’s office with signs, bells, drums. Eventually, more than 130 people showed up. Trainor said, she’s not surprised by the turnout. “You know we have a Senator who happens to be in a very powerful position within the current congressional leadership and Sen. Murkowski, in addition to being well positioned to weigh-in and to potentially change the direction of what happens in the future with the supreme court – I think her being a woman is very significant,” Trainor said. Right around the same time, 900 miles away, another crowd gathered at Murkowski’s office in Anchorage. There, about 150 people had a similar message. “She’s the only Republican I’ve ever voted for, and I think she’s in a very difficult position and we are hoping and praying that she does the right thing,” Kim O’Brien said. O’Brien feels that if Murkowski votes for Kavanaugh — it would be a betrayal. “She’s a swing vote, and we want to swing her in the right direction. The direction of morality. And, respect for women and the American public,” O’Brien said. There were demonstrations in other parts of the state as well. In Petersburg, a city in Southeast Alaska with about 3,000 residents — a protest organized late this morning had about 25 people by noon. In Fairbanks, the Daily Newsminer reports that about 40 people gathered outside of Murkowski’s office. Meanwhile, in Washington D.C., Murkowski joined Arizona Senator Jeff Flake in calling for an delay of the confirmation vote. Senate Republicans have agreed to a one-week delay and President Donald Trump has called for an additional FBI investigation into Kavanaugh. Abbey Collins, Orin Pearson and the Fairbanks Daily News Miner contributed to this story.